As the son of a career firefighter, I was taught early on the importance of giving back and community service. My father was someone who dedicated himself to his fellow firefighters but he also took pride in serving his community. Growing up, I watched with admiration as my father took on leadership roles within in the fire service; he served in several union positions that included 6th District Vice President of the International Association of Firefighters. 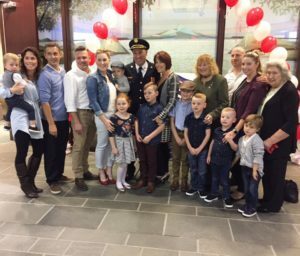 Upon retiring from the fire service, he chose to continue to serve the community he loved as Mayor of Burnaby for 3 consecutive terms. While these accomplishments speak volumes of his character, he never lost sight of what was most important, his family.Over many years of watching and listening, I was motivated to pursue my dream of becoming a career firefighter myself. In July of 1982 I realized my dream when I was hired by the Delta Fire Department. I have been married to my wife Theresa for over 37 years, we have three grown children and 8 wonderful grandchildren. My son like his grandfather and father is a career firefighter serving with the city of Burnaby for the last 10 years. My two daughters are both professionals; my oldest runs a successful small business with her husband the youngest is a public school teacher. For 36 years I have lived, worked and raised my family in Delta. During this time, it was my privilege to serve 25 years on the Delta Fire Department front lines, protecting citizens of this community. In addition, I spent the last 11 years as Delta’s Fire Chief. I have dedicated my life to public service in an effort to better this community. Whether coaching amateur sports, supporting community service groups, assisting with the parent advisory committee or collaborating with key stakeholders, my objective has always been the same; to keep our kids, families and community safe by putting Delta and its residents first. In my position as Fire Chief, I understood the importance of being an effective leader and critical thinker. I was able to limit problems by planning ahead. My position afforded me the opportunity to work collaboratively with the Firefighters Union and government officials at both the provincial and federal levels. I was able to advance many new initiatives and secure funding and resources that focused on the betterment of our community. Most rewarding in my career as Fire Chief was to work with Delta firefighters advancing new training strategies. Through this initiative we were able to implement new equipment and improve upon the services Delta firefighters provide to Delta residents. Delta firefighters are among the highest trained First Responders in the province; they also possess the most diverse skill set in the province, if not the country. A testament to their skills and abilities is how they managed and contained the 2016 Bog fire. Crews worked tirelessly to battle the 55-hectare fire and protect the Tilbury Industrial Park from fire spread when the fire jumped a 6-lane highway. In July of this year, crews were able to respond and mitigate several house fires caused by flying embers from a large fire in Surrey; all while protecting Watershed Park from fire extension. It is an Honour to receive the support of the men and women of the Delta Firefighters Association Local 1763 IAFF. Their commitment and dedication to public safety and community service is second to none.